Would you say you had a resilient garden? Did it stand up to the challenges of this past growing season? This year has been especially difficult for many of us, and while we’re in the middle of my favorite garden time – fall – I’m also already in planning mode for next year. Each season, I make a point to look back and make note of my garden successes and things I would like to improve on in future. Sure I’ve been gardening most of my life, but every season is different. As it probably is in your garden, each year brings me a few disappointments along with those pleasant surprises. I’ve come to recognize that we, as gardeners, are a group of optimists. We find it oh so easy to forget the little heartbreaks as a new season dawns with exciting possibilities. For that reason, I’ve made it a habit to gather my thoughts and keep notes. Last week, I shared the seven key tenets I’ve come to rely upon to build a garden that is eco-friendly. That podcast included basic principles for leaving a lighter footprint in our own little corner of the world. This week, I want to share with you a list of techniques I rely on to build resilience into my garden. These time-tested methods will work for you, too, when Mother Nature puts the pressure on. 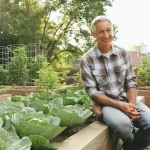 Even before I became host of a new garden show back in 2003, I had been relying on the same key principles in my own garden to keep it healthy and resilient. They continue to serve me well to this day. In 2003 I began my television hosting career when I was selected to host a new DIY network series, Fresh from the Garden (FFTG). The series was unique in that each episode taught viewers how to grow one particular crop from seed to harvest. Although the show was intended to run just one season, it was so popular that it continued for two additional years and could have expanded to a fourth if we hadn’t already featured every possible American crop. As we began to develop the show that first season, I was given an ultimatum: Failure is not an option. After all, this was television. The garden had to look flawless at all times, and every crop had to be a resounding success. That’s a tall order in the world of gardening. In spite of our best efforts, Mother Nature keeps throwing those curve balls which disrupt perfection. So for the crew and me, the pressure was on every day. Nature is always in control. It’s up to us to work in concert with nature to achieve the best possible result. As host and expert, it was my job to grow a garden that could weather any storm. Fortunately, the techniques I had relied on in my own garden served me well, and the show garden thrived while other area gardens were lost to the throes of a particularly difficult year. Difficult is an understatement, actually. That first year was a whopper. Gardening in the heat and humidity of Atlanta, Georgia is always a challenge, but 2003 was memorable. There was an unseasonable spring cold snap after we put seeds and seedlings into the ground. Weeks of wet weather then followed. Suddenly, the rain stopped, and temperatures soared. As if that weren’t enough, our area was hit with two tropical depressions, which brought high winds and heavy rain. The show garden stood up to every challenge and remained picture perfect throughout. How? I had put the following ten principles into practice. I talk about many of these topics often, but they are so important that they bear summarizing. During Year One, we selected the garden location, built raised beds and amended the soil – all to establish the proper foundation for camera-ready crops. Finding the right location was the critical first step. The purpose of the garden was to plant vegetables, so a spot with full sun was vital. Those edible crops require six full hours or more of sun in order to properly produce. If you are growing only leafy crops, you can eke by with fewer sunlight hours. Otherwise, it’s essential to a resilient garden to site beds where they will receive at least six hours of full sun. 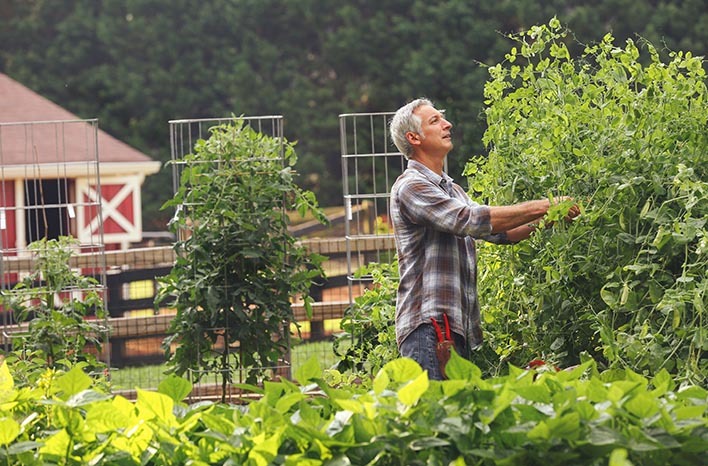 As the host of the DIY network series, Fresh from the Garden, it was my job to keep the garden looking this great and producing healthy crops every day. This garden thrived despite some heavy blows from Mother Nature. It’s also more important than you may think to locate the garden near your home. A resilient garden requires a proactive gardener, committed to spending at least a little time each day looking for early signs of trouble. After a long day at work, you might be tempted to sit down in that easy chair, so the more convenient it is to get out among your plants, the better. When your garden is just steps away out the door, you are more likely to remain engaged and your crops will reward that effort. Consider how accessible your water source will be. Here again, convenience is key. If you have to drag a hose across the yard, you may be tempted to skip watering on a busy day. During the first FFTG season, our water supply wasn’t convenient. It was a hassle dragging a long hose around, but since failure wasn’t an option, I stuck with it. If I hadn’t been motivated by the pressure of television production, I would have been sorely tempted to shirk watering duties at times. More plants die from overwatering than underwatering. That’s why good drainage is so important. 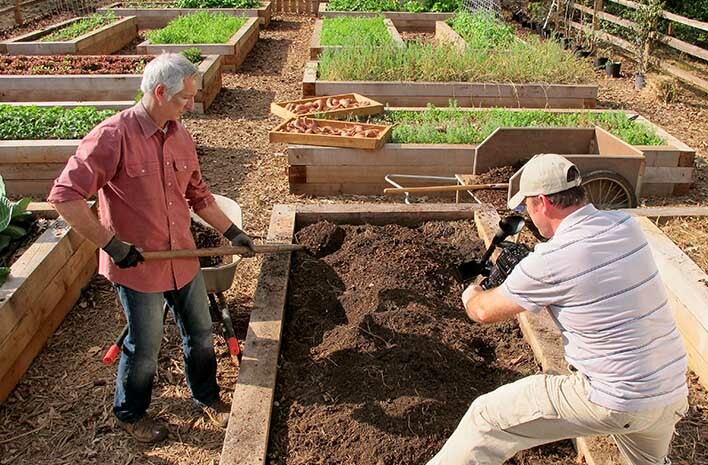 We used raised beds and in-ground beds on the FFTG set. Atlanta-area soil is hard, red clay; so it doesn’t take in water very easily and certainly isn’t conducive to good drainage. 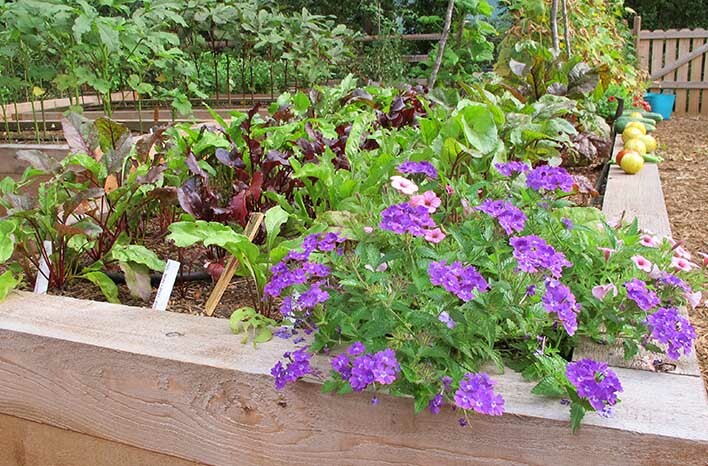 Raised beds are more forgiving when it comes to drainage, since you can control the bed soil quality and have more depth in which water can drain away from plant roots. Regardless, we tilled the entire footprint of the show garden space. I am not a proponent of tilling, but preparing an area for the first time is one instance when tilling can be a good approach. We needed a quick way to break up that Georgia clay and add amendments. Tilling was the best means to do that. You can see here how much difference tilling in amendments during our first season preparation for Fresh from the Garden made to the hard, red clay of the Atlanta area. It wasn’t necessary to till under the area where we would place the raised beds, but I insisted we take that step. I wanted to provide a base for those beds which was conducive to plant roots going as deeply as they wanted. Lush, productive plants require good drainage and the ability to set deep roots. Breaking up the soil surface and amending with organic materials under the beds created the best environment for that. Gardening on a level site is another important drainage consideration. Water will seek the lowest level, so a sloped surface can result in uneven watering, pooling and mulch or soil erosion in a heavy rain event. Keep your garden site as level as possible. It’s difficult to have a productive and resilient garden without really great, healthy soil. This is why I talk about soil health so often. It’s been fundamental to my success. 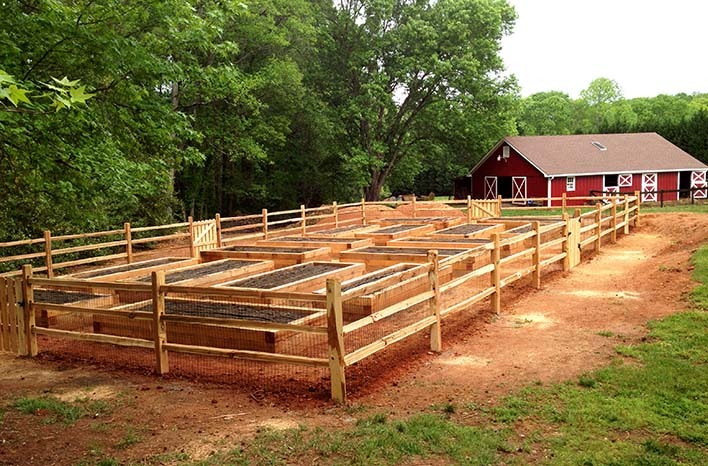 As we tilled the FFTG garden area, we added organic amendments to improve the soil tilth. For our in-ground beds, in particular, that was an important step. It improved the soil under the raised beds as well, but it was the soil in the raised beds where I was really able to prime the garden for show stopping results. One of the main benefits of raised beds is that they allow you to engineer the soil in the beds. As you fill them, you are in control. I’ve developed a “soil recipe” that I’ve used for years and shared in a Raised Bed Gardening podcast series earlier this year. That recipe provides the ideal percentages of soil, compost and other key ingredients that all contribute to great soil. Even if you’ve already filled your beds, the soil recipe can help you amend them for better results next year. 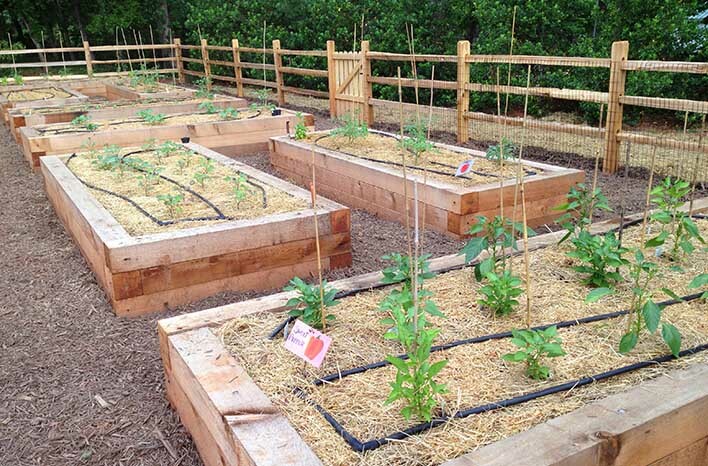 The main benefit to gardening in raised beds is the ability to better control the soil in the beds. It would take much longer to develop soil this beautiful in an in-ground bed. Each one of those edible plants in your garden will need exposure to full sun for six hours. 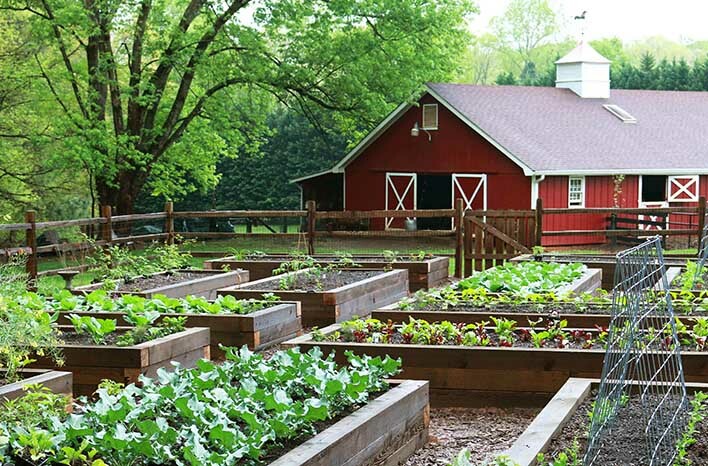 So, how you orient the different crops in the garden can make a world of difference. It doesn’t matter if your beds are oriented east to west or north to south. If the area is in full sun, your garden will do equally well either way. What matters is where you place each crop within the garden beds, and it was a big consideration as we mapped out the Fresh from the Garden plantings. Here in the Northern Hemisphere the sun’s rays angle from the south, so we need to keep tall plants – like corn or indeterminate tomatoes – on the north or the western side of the bed. This prevents towering foliage from shading out shorter crops like radishes or squash. Using this technique, we got maximum crop production that wowed our audience (and, thankfully, our producer). Here at the GardenFarm, I keep taller plants toward the northern areas of the garden area. That way, they won’t shade out the shorter edibles, like my cabbages. I used these methods for Fresh From the Garden, and I continue to use them at the GardenFarm™ – set of my current show, Growing a Greener World®. They are efficient, save me hours of time, and keep my plants producing and looking great. There are times during severe drought when these options just don’t provide enough moisture. I experienced a year like that during my time at FFTG. For those periods, I hand water or – in a large garden where hand watering is impractical – I turn to overhead sprinklers. That might surprise you. I’m not a fan of overhead irrigation. However like all savvy gardeners, I learned when it’s appropriate to use the different tools available to me. During days I anticipated that the garden would need extra moisture to get through the heat, I set an overhead sprinkler early in the morning to provide a good soaking. By using the sprinkler during the dew cycle – the earliest morning hours – evaporation was significantly reduced and the foliage of my plants had more time to dry off. The emitter tubing I use in my raised beds at the GardenFarm are efficient and prevent the foliage of my plants from getting wet. I talk about mulch a lot. That’s because it is so important for a thriving garden. Many gardeners think of mulch as aesthetic, and it does look terrific in beds and pathways. Mulch has kept the gardens I’ve grown for television looking great, but it has done so much more. 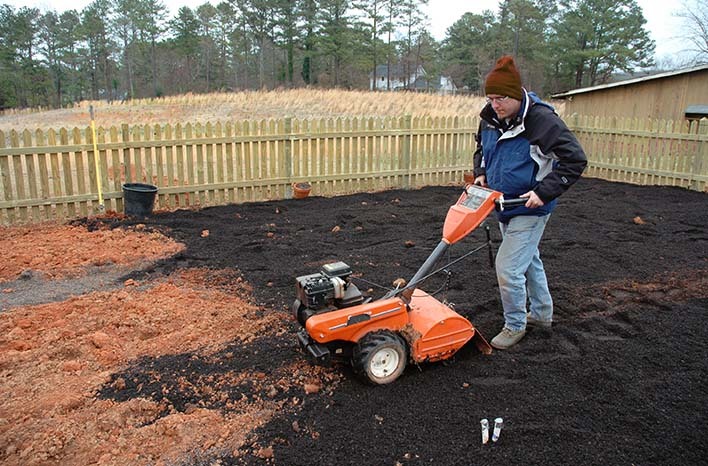 For starters, mulch provides a layer of soil insulation. During hot, dry days the sun can beat down on exposed soil and harden the surface, making it impermeable to water. Mulch prevents that. It also blocks light from reaching weed seeds in the soil, so they are much less likely to germinate. I place mulch over my drip irrigation and emitter tubing, because it helps hold moisture near the soil surface. 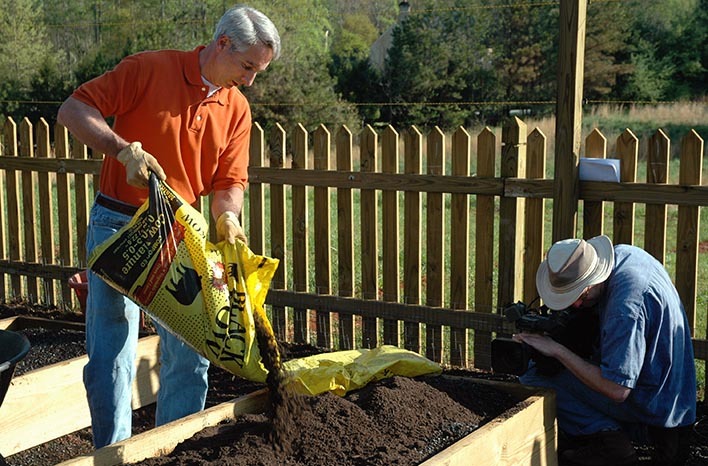 The best mulches are organic materials, like shredded leaves or straw. Wood chips from a sustainable source are one of my favorite mulch options. Natural mulch materials break down over time and provide nutrients, so my soil gets better and better while also being protected. For many reasons, I recommend against rubber mulches, stone mulch and landscape fabric. I also recommend against dyed wood mulch, since it is often made up of materials which have been chemically treated. You will enjoy a more robust and resilient garden when you put a natural mulch to work for you. 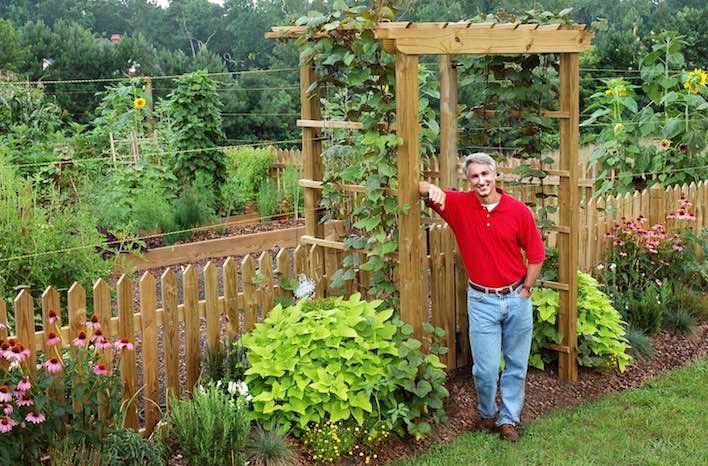 I have always used natural mulch in garden beds and pathways. 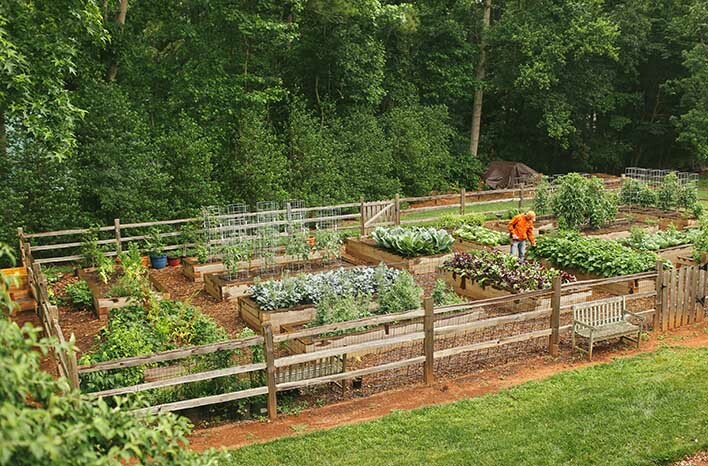 It looks great, but more importantly, it provides many benefits for a resilient garden. During production of FFTG, I was in the garden every day. I was able to watch plants for those subtle (and sometimes not so subtle) signs of disease before things had an opportunity to get out of hand. Since I was able to proactively cut out diseased foliage and remove it from the garden right away, I encountered few disease problems during a time when other area gardeners were being clobbered. Whenever possible, the first safeguard is to purchase plants bred for resistance to diseases like nematodes or fusarium wilt. Look for plant tag indicators like F or V to identify which species will be inherently disease resistant. Bear in mind that disease resistance is not the same as disease proof. A resistant plant can still fall victim under the right circumstances, so observation and early removal are still fundamental to staying ahead of the game. Whenever I recognized early signs of disease, I made the most of my opportunities to proactively apply an organic treatment, like copper or milk spray, to prevent the disease from further spread. These fungicides won’t cure your problem, but they will minimize it. You can manage all your garden issues more effectively when you take time each day to discern when to take action. Stay engaged. Spending even just a few minutes every day looking over your plants in the garden will help you key in to early warning signs of pests and diseases. Speaking of garden issues, there are two basic categories of garden pest: Insect pests and critters, like deer or raccoons or voles When it comes to the critter variety, I can attest to the fact that it is unrealistic to think you can keep them all out. Squirrels and raccoons, for instance, are nimble and determined. They will get under, over or around just about any obstacle we might try to use as a safeguard. Deer are persistent too, but they can be prevented with a good fence. We built a 10’ deer fence around the FFTG garden. It was constructed of three strands of electrified wire over a 4’ wood picket fence. Deer are remarkable jumpers, so a fence that is at least 8’ high is necessary. My GardenFarm garden is surrounded by a fence just 4’ high. Deer have poor depth perception, so they don’t like cramped spaces. The area inside the fence is filled with my 16 raised beds, and it’s that density that has kept deer out of my garden for seven years running. Unfortunately, they don’t hesitate to munch on the plants and shrubs in my landscape. Did you know that deer are even more inclined to crawl under a fence than go over it? To prevent this and to keep out moles and voles, I added hardware cloth to the base of both the FFTG and GardenFarm fences. Hardware cloth is a wire mesh available in different sizes, and since it’s metal, pests can’t chew through it. We buried 6” of hardware cloth attached to the fence and extended the cloth up the fence another 18” to keep out as many creatures as we could. It was the Fort Knox of gardening, but it had to be. Barriers can be an effective insect pest deterrent too. I place floating row cover over crops to keep moths from landing on plants and laying their eggs in the foliage. 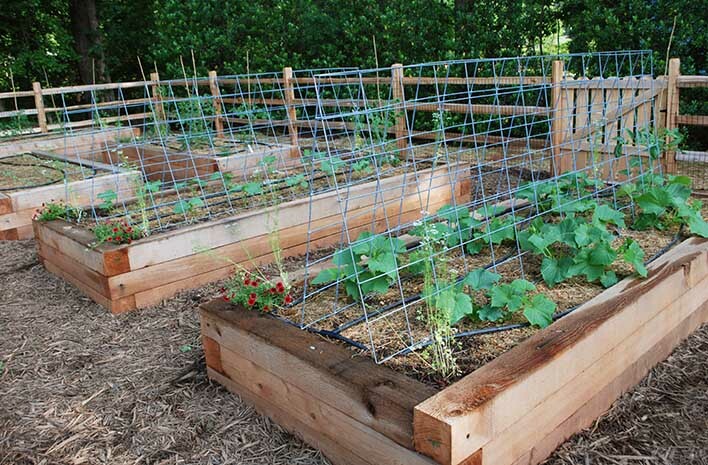 Row cover allows air, light and water in to your garden beds, but it keeps bugs out. The best time to use floating row cover is in spring and early summer – the season when moths (like the cabbage worm moth) are most likely to lay those eggs. There are many insects which will get into your garden in spite of barriers. For those, your best line of defence is manual control. When you stay engaged in your garden, you have the opportunity to pick the bugs off and squish them, knock them into a cup of soapy water or spray them off with a stiff blast of water. It takes a little time, but it’s safer and can be more effective than chemical treatment. The fence around the GardenFarm garden is just 4′ high, but it is so tightly filled with my 16 raised beds that deer don’t know how to navigate the space. That keeps them from jumping inside and helping themselves to my vegetables. Chemical treatment can cause more harm than good when it comes to pest management. Those chemicals don’t know the difference between a good bug and a bad bug. So while a spray is killing those tomato hornworms, it’s also taking out the beneficial and predatory insects which would kill the hornworms (and other pests) for you. Allowing predatory insects the time to move in and eat the bad bugs can be a frustrating exercise in patience, but it’s worthwhile. As more predatory insects move in and multiply in your chemical-free garden, they become your pest-fighting army, and your pest problems will be significantly reduced. You can encourage more beneficial and predatory insects to wage war in your garden by striving for plant diversity. Learn the flowering plants these creatures need and are drawn to and incorporate those in with your edibles. The good bugs will utilize these plants as shelter and a pollen food source, and the blooms will make your garden look better too. It’s no secret that vegetable gardens can look a little worse for wear by the end of the season, so by adding the right blooming plants, you get twice the advantages. I tucked nasturtium and alyssum and other key beneficial insect plants into the garden beds of FFTG. It looked great on TV, but my underlying motive was to increase the population of good bugs. One of my greatest joys during filming was watching the lively activity of the many beneficial insects at work. The garden was full of life – but low on pests – thanks to diverse planting. I tuck blooming flowers, like this calibrachoa among my vegetable beds at the GardenFarm. They brighten up the bed, but their more important function is drawing in beneficial insects. Not all bloomers are attractive to beneficials, so do a little research before selecting plants. Tidiness at the Fresh from the Garden set was a show-quality requirement, but it served a dual purpose. By trimming out overgrowth and pulling the few weeds which did sprout before they had an opportunity to set seeds, I was safeguarding my plants – reducing the areas where diseases could fester and pests could congregate. Tackling a little bit each day cut down on overwhelm, and it allowed better air circulation around plant foliage and more light to reach into the plants. This meant better production and lower risk of disease. The show producers loved that the viewers were able to better see the plants, but those plants were more worthy of being seen because they were thriving. On the subject of air and light circulation, here’s my bonus eleventh principle: Make sure you space your plants appropriately. It’s so tempting when they are small to squeeze them in and maximize your garden space. So, pay attention to the mature size indicated on the seed packet or plant tag. When plants that have been placed too closely together reach their mature size, they crowd out air circulation and sunlight. Crowded plants are not resilient plants. There you have it. My top ten techniques for a resilient garden. It worked for me then, and it continues to work for me now at the GardenFarm. I’ve toured many gardens during my hosting career, and I can tell you that all the great, healthy organic gardens are following these same principles. Your garden will be better when you put them to work for you. Which pest was the biggest problem in your garden this season? Share your experience in the Comment section below. Then, check out my recent podcast on the top predatory insects you want most in your garden. If you can draw those beneficials in, odds are very good that the pest of this season won’t be as much of an issue next year. If you haven’t already listened in, you can scroll to the top of the page and press the Play icon in the green bar under the title. I share a few more stories from my Fresh from the Garden days that I hope you’ll enjoy and benefit from. No doubt, you will hear me mention each of these ten principles in future podcasts – they are too fundamental to good gardening to exclude – but I hope you’ll find this list to be a good one-stop resource to build a garden which can weather any storm.